Oral and Maxillofacial Surgeons require hospital based surgical and anesthesia training following dental school. 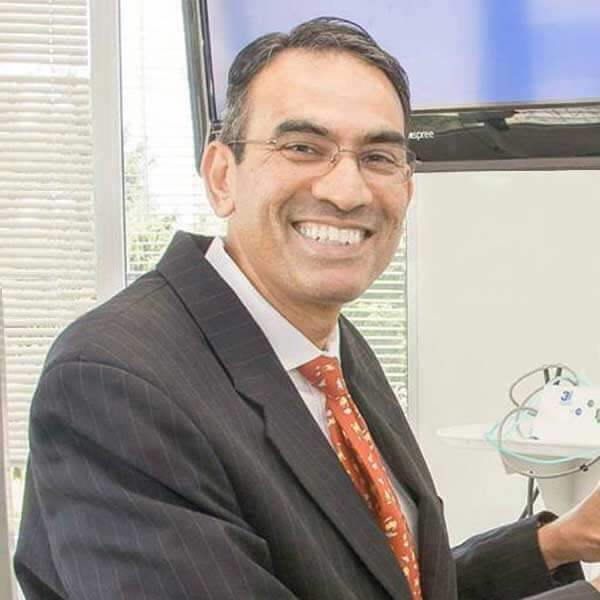 Dr. Sreeni came to the United States as an Oral and Maxillofacial Surgeon from India and then put himself through dental school again at Boston University and Oral and Maxillofacial Surgery residency at University of Medicine and Dentistry of New Jersey. As an Oral and Maxillofacial Surgeon, Dr. Sreeni manages a wide variety of problems relating to the mouth, teeth and facial regions. Dr. Sreeni practices a full scope of Oral and Maxillofacial Surgery with expertise ranging from Corrective Jaw Surgery to Wisdom Teeth Removal. He can also diagnose and treat Facial Pain, Facial Injuries, TMJ Disorders and Sleep Apnea and can perform Facial Rejuvenation procedures, Bone Grafting and Dental Implant surgery. Dr. Sreeni is the fellow of the American Association of Oral and Maxillofacial Surgeons and American Dental Society of Anesthesiology. He is a member of the Maryland society of Oral and Maxillofacial Surgeons, Mid Atlantic society of Oral and Maxillofacial Surgeons, American Academy of Sleep Medicine​ and a longstanding member of American Dental association. Dr. Sreeni’s staff are trained in assisting with IV Sedation/General Anesthesia within our state of the art office setting. Patients are continuously monitored during and after surgery. The goal of the office is to provide professional service with compassion and an understanding of the patients’ perspective. Dr. Sreeni has also completed a residency in Anesthesiology at Mount Sinai Hospital, New York and has worked as an Attending Anesthesiologist providing services for children and adults in the ambulatory out-patient center of the hospital. Dr. Sreeni is an instructor for basic and advanced cardiac life support for the Adventist group in Maryland. He is also certified in Pediatric advanced life support and is very capable of handling emergencies that could possibly arise in the office. The goal of the office is to provide professional service with compassion and an understanding of the patient’s perspective.